A new development at the George Mason University campus in Fairfax, Virginia, heralds an interesting turn for the food delivery industry. Students, staff, and faculty on campus can now order food and drinks with the help of robots. A strategic partnership between robotics firm Starship Technologies and food service giant Sodexo has created the Starship Deliveries app, which promises to change the future of food delivery, especially on college campuses. Now, brands like Starbucks, Dunkin’ Donuts, and Blaze Pizza will be readily available for George Mason students, along with 2nd Stop, which is Sodexo’s on-campus grocery store. How is a robot different from human delivery? Apart from the fact that college students are intrigued by new technologies, and are therefore more interested in trying the app out, the app is designed to be more efficient than traditional deliveries. When diners select their food and drink items and place an order for delivery, they have the option to drop a pin to the place where need the item to be delivered. As the robot is deployed to deliver the food item, the user can track its progress through a map. Once the robot arrives, the user gets an alert. He or she can then unlock the door to receive the order and pay via the app as well. George Mason is not the only campus to make news in this regard. A fleet of self-driving robots are helping to deliver snacks and beverages on-campus at University of the Pacific in Stockton, California. The Snackbot app, created by Pepsi in partnership with Robby Technologies, delivers healthy snacks and beverages from Hello Goodness. The latter is a Pepsi brand that offers healthy product choices and snacking options. Across the Atlantic, a Go Technology report released by data insight company CGA shows that 28 percent of British consumers are now ordering more food online than they did a year ago. The number will almost surely rise, and new technologies in the sector could change the way they order takeaways. It is interesting to note that GPS tracking; robot and drone delivery; and automated, voice-based ordering seem to be at the forefront of millennial minds. This generation believes that these technologies are essential components of the food delivery process and 15 percent anticipate that driverless vehicle technology will become an intrinsic part of the delivery system in the future. 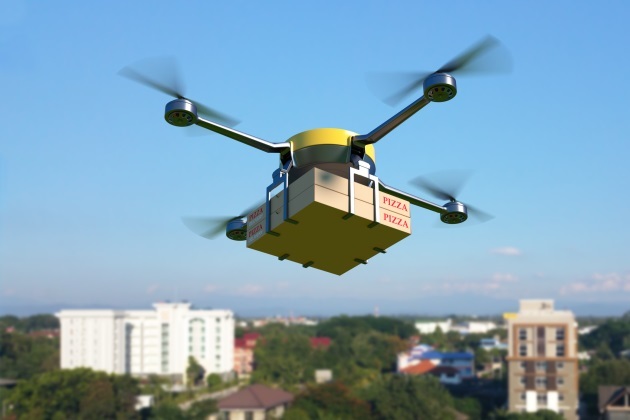 Companies such as Uber and pizza chain Pieology are already in the early stages of using drone-based food delivery programs. On-demand restaurant delivery service DoorDash is also in the early stages of a similar experiment. It is partnering with Cruise Automation’s driverless vehicles for food and grocery deliveries. In the pilot program, DoorDash will focus on exploring grocery fulfillment service from certain grocers.